purplecats corner: fancy a cuppa? 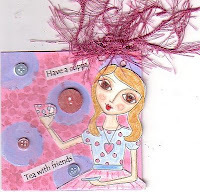 A "cuppa "if you don't know is a cup of tea!, I made this chunky book page (4 x4) for my good friend Mary aka therapyartist over on http://www.atcsforall.com/. She asked for one of my girlies with a cup of tea, so thats what she got! 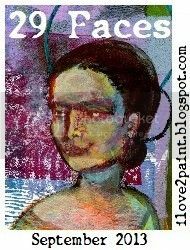 I am working on a new girly on wood, a kind of hippy chic, I will post pics when I am done. All your paintings are so beautiful! I am off on my holidays!!! I am IT-I have been tagged!